Dimensions (HxWxD): 3" x 1.65" x 1.25"
This translucent 3 inch long Indigo Quartz in Matrix Specimen, weighing 85 grams or 3 oz. is perfect for holding in hand, placing in a pocket or on the body during meditation, reiki or any energy work. A good stone to put under your pillow if you're having trouble sleeping or relaxing at the end of a long day. 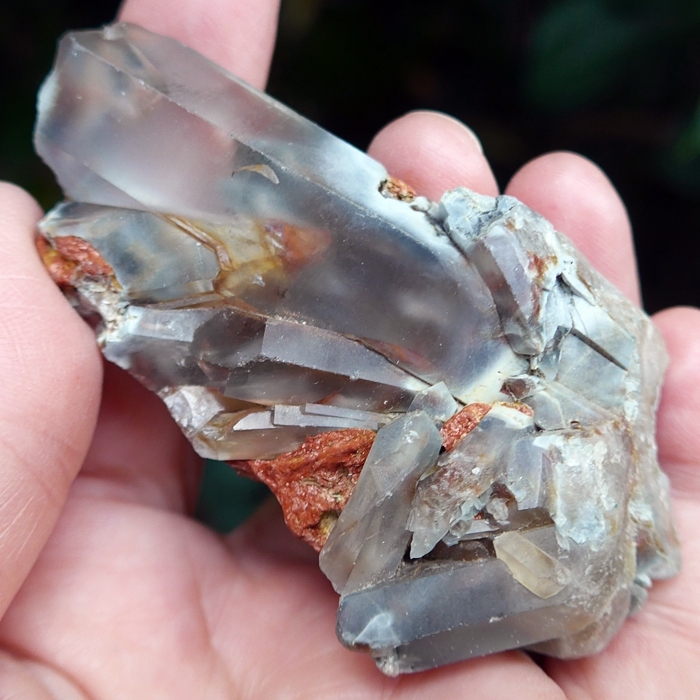 The main point in this Indigo Quartz cluster, which got its gorgeous aquamarine color from actinolite inclusions, was broken off midway down the shaft, but several smaller points are still intact. 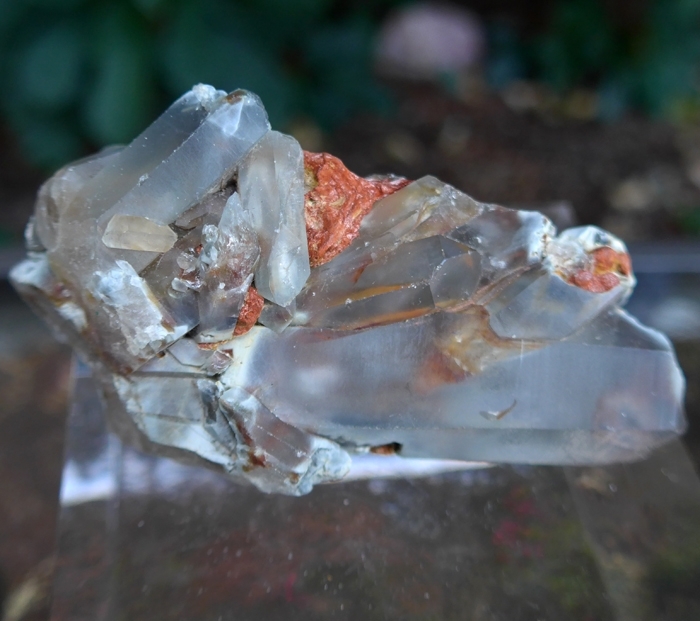 This specimen retains its unique energy signature despite its condition. 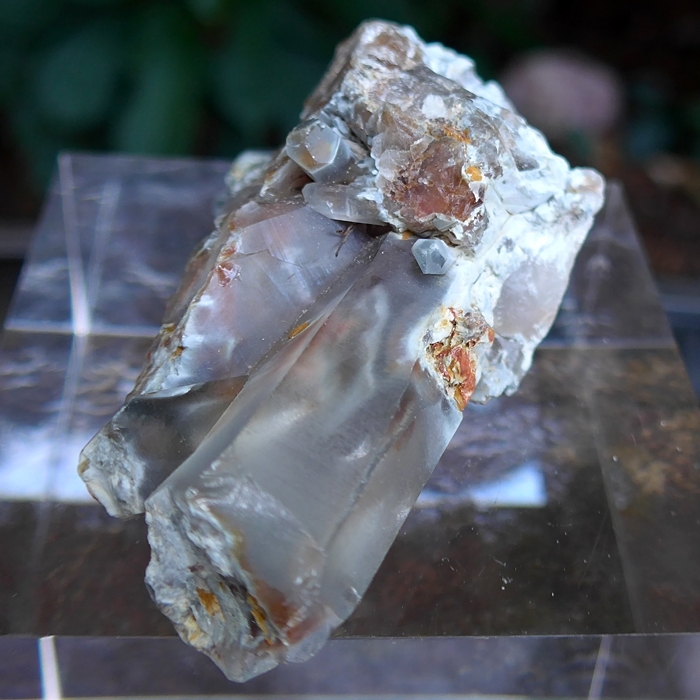 Extremely rare, translucent Indigo Quartz contains formations of ochre coloured actinolite, a hydrous calcium magnesium iron silicate. This Indigo Quartz crystal comes to us as part of a small shipment from Brazil, where it is available directly from the source in very limited quantities. This Actinolite Indigo Quartz is an alluvial stone, meaning that it is found in river deltas, where it washed downstream from the mountains where it was formed. These rare crystals were found in the fields of farmers in Bahia, Brazil, near the surface of the Earth. No mining was involved. Actinolite based Indigo Quartz is considered to be an immensely powerful spiritual tool by crystal healers and practitioners of meditation. Crystal healers use Indigo Quartz to activate the throat and third eye charkas, strengthening the individual’s ability to apprehend and communicate psychic and spiritual insights. The throat chakra is considered to be colored blue in the Western chakra system, and the third eye chakra is seen as magenta. Jane and I are deeply impressed by the powerful healing energy generated by this rare Brazilian Indigo Quartz, because of our personal experience with the stone in meditation and in use during Reiki healing sessions. 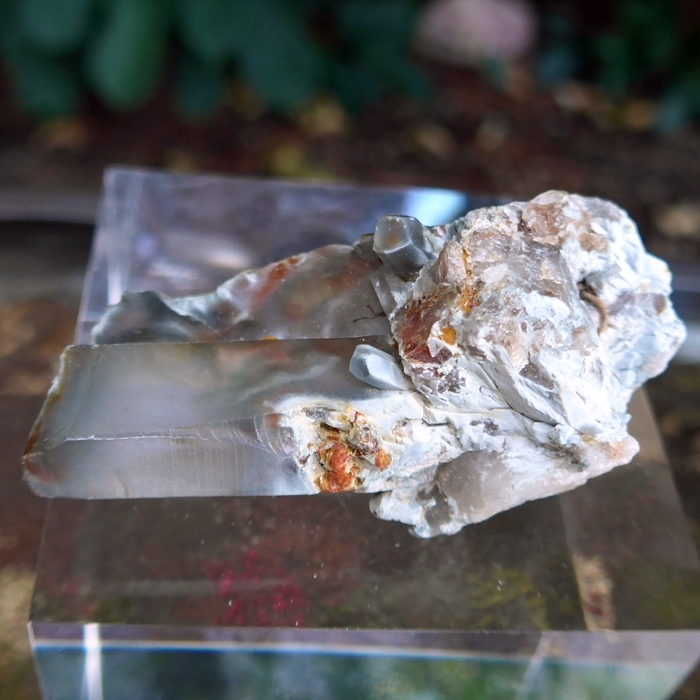 When we use Actinolite or Indigo Quartz in Reiki sessions we find that it imparts a feeling of profound protection, deep relaxation and reverential quietude to clients seeking healing. We also use & recommend Actinolite to those of you for whom sleep is an intermittant affair. Actinolite promotes relaxation & gently eases the bearer into sound & deep sleep. Actinolite based Indigo Quartz soothes the soul, calms the mind, and relaxes the body. Indigo Quartz strengthens, stimulates and harmonizes the individual’s etheric, astral and causal bodies, releasing fears in a comforting energetic space, and providing for deep healing of long-held emotional and mental blockages. Simply hold this Indigo Quartz crystal in your hand during meditation, and feel the flow of peace and stillness spread throughout your aura, facilitating the cessation of mental chatter and the complete relaxation of the emotional body. You will then notice the feeling of relaxation and peace extending into the physical body as well. We know you will use this powerful Indigo Quartz crystal as a tool to radiate peaceful, healing energy throughout your environment. Indigo Quartz can be used as an energetic generator to infuse any stressful or conflicted environment with healing, harmonious energies, conducive to co-operation and peaceful resolution of disagreements or conflicts. Note: Weight above is shipping weight. Actual weight is 85 grams or 3 oz.